Anyway, my real business there was DiSS 2015. I love this conference. This is one event I try to make every effort to attend every time, because it's one major conference where every single presentation is directly related to my research interests. Also, this year, the organizers decided to go for a slightly different arrangement: Basically, except for three invited talks, all presentations were poster presentations, grouped into small thematically-related groups of about four or five posters and then introduced by a short talk that summarized them or extrapolated from them. Then, there was a good hour or so of time to browse the posters. It was a very nice idea and made it possible to see all the posters and interact with each presenter in detail. Bravo, organizers! In my talk, I presented some preliminary data on the use of um and uh as differential delay markers. 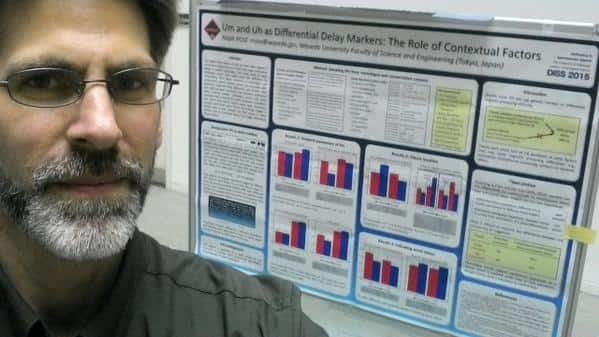 There's quite a bit of research on differences between um and uh showing that uh tends to be associated with shorter delay and um with a longer delay. However, there's not so much work establishing the respective causes of short and long delays. The data I have from both a monologue and conversation corpus shows that clause location does seem associate with differential delay (i.e., um vs. uh is differential at clause boundaries, but not internally), but frequency of following word does not. People who want to see the gory details can access my poster here, or the full paper here. I'm already looking forward to the next DiSS, probably in 2017. The location hasn't been decided yet, but if it is a satellite of ICPhS, then that would put it in Stockholm (where it was in 2013, in fact). No matter where, though, I plan to be there.